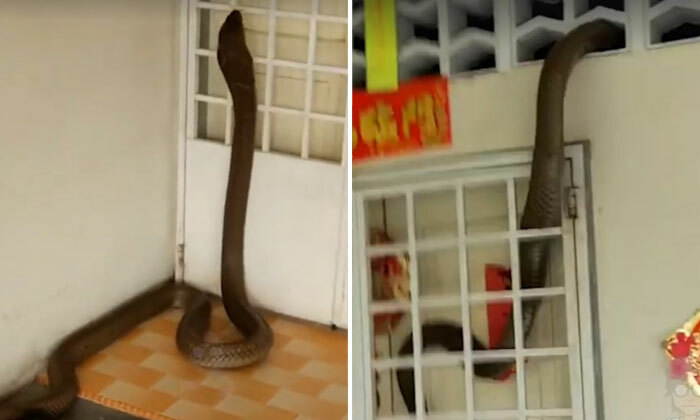 DERRICK Koh’s video went viral last week when he filmed a giant king cobra slithering up the front door of his house and through an open window. The footage, caught on a mobile phone outside his house in Batu Pahat in the District of Johor, Malaysia, showed the snake climb the gate and disappear out of sight.Koh can be heard screaming in the video as the cobra becomes entangled between his front door and a terrace screen. That was June 18. He and his family assumed the snake had escaped as easily as it had entered and went about his daily routine.Koh told Malaysian newspaper The Star that he suspected it had left through the back windows.Then he spotted something that made his skin crawl.He noticed fresh faeces next to his desk and a crush mark on his suitcase where the reptile had attempted to take a bite.Koh told Storyful: “During the past three days and two nights, my family ate, watched movie, surfed the internet and slept as usual. We would never have thought this snake would stay in my room. It had many opportunities to kill us, but it didn’t. Now to think of it, I feel like I escaped hell.”A new video has since emerged after Koh called snake handlers to take care of his situation. In it, the giant snake, estimated to be eight-feet-long, was carried off the property. King cobras, which are common on the region, can grow up to 19-feet and a bite can kill a human in less than 30 minutes.